Q Cat is an envelope filter effect pedal. This effect is widely used, you hear it often appeared in various music, but you might have missed it, because you might think it is just plain wah sound, In fact, it is a special wah effect, and it is neither an auto wah nor wah pedal with manual control. The basic principles of Q Cat is using the intensity and speed of play to control the wah filter to open and close. This is equivalent to that the cadences of dynamic change turns into the control factor which controlling the wah filter on and off. So, Q Cat can combine the performance details and wah effect. The FREQUENCE knob can change the moving interval of the wah filter, in short, by adjusting the FREQUENCE knob counterclockwise, you can get sharp wah effect, and this tone is suitable for playing funk music. You also can get low wah effect by adjusting the FREQUENCE knob clockwise, and this tone is suitable for playing solo. When you adjust the RESONANCE knob, the wah effect will transit from light wah effect to very intense double push wah effect. The RECOVER switch is used to select the opening speed of wah filter. Dynamic filter effect can be applied to all kinds of music, and also can be used with any other effect. 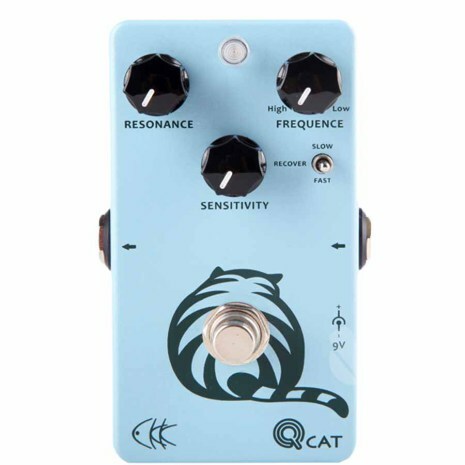 When Q Cat is connected in the front of overdrive, you can play some sensible music like blues and jazz, and when Q Cat is connected in the front of distortion or fuzz, it is suitable for playing some metal and aggressive music.